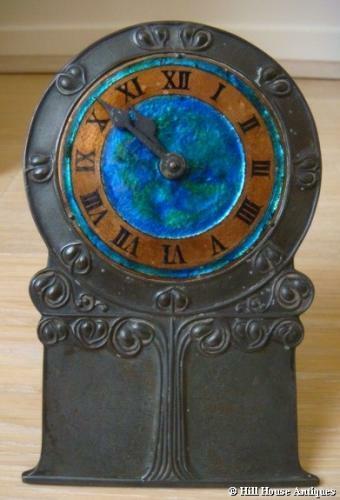 Sweet little Arts & Crafts Liberty & Co, Tudric, well patinated pewter and enamel easel mantle or bedside clock; 30 hr movement, shape number 0636. Stylised floral design to front and clock face with copper ring and a stunning surrounding peacock blue enamel; c1903. Design attributed to David Veasey.